I did it! I got the 2017 carving made before the end of 2017! This Christmas tree turns out to have quite dense, tough wood, and I was quite glad I'd chosen only a thin piece to carve. I didn't have any great ideas about what to carve, so I just chopped bits off and found after a while that I had made a twirly snake. Then it looked like there was a sort of blob left on the top, and Pp suggested I make it into an apple and make it Garden of Eden themed, so that's what I tried to do. The bit sticking up is more or less apple-tree-leaf shaped. So, now next year I definitely only have one carving to make, not two. I wonder if I'll remember that in Dec 2018. And a written thing: I was trying to write Quenta Narquelion as a story entirely from Ghost Feanor’s point of view but it turns out that the downside to a single POV is that you don’t get to answer questions about when other people work things out? Who knew? This writing thing is so complicated. POV switching is the way to go, honestly, writing just one POV starts to feel like being stuck inside a box after a while. 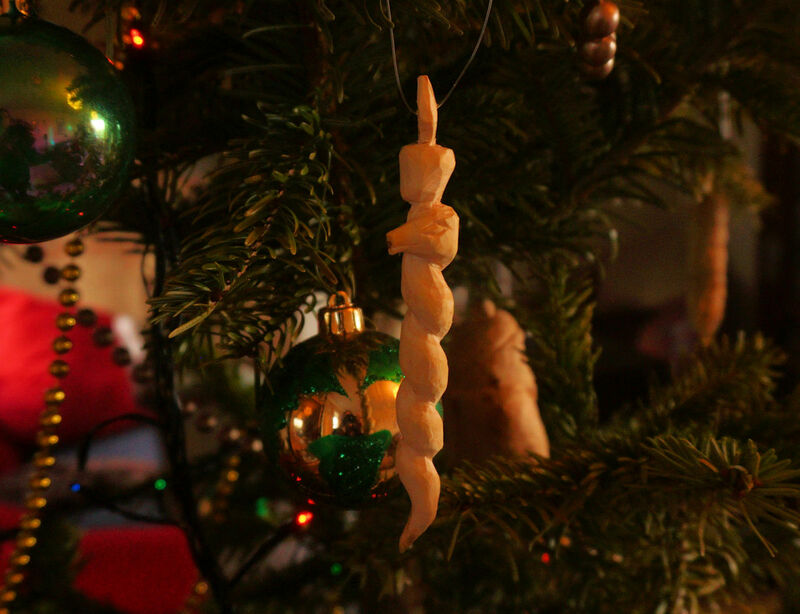 Love the whole idea of carving something from the tree. Awesome idea and this year's is great! I've been doing it for about 20 years now, so I have amassed quite a good collection of them, though the style and execution does vary quite a bit! Pomaceous and serpentine -- I like it! The fic is great. Interesting how seeing Feanor gives Maedhros that one little bit of hope that perhaps his brothers are nothing worse than safely dead, though I have a feeling that he is not really including himself in that hope. Also the bit where he hopes that Elros and Elrond will be mortal and short-lived enough to actually live out a normal lifespan without dying horribly. It is so horribly depressing being Maedhros. He must have found being finally dead so very restful after Beleriand. Oh it is, the poor chap. You feel the Halls of Mandos must have come as a great relief to him, though one can hardly accuse him of having gone there prematurely.